Reliable, secure and anonymous Offshore Hosting in several international Location and Datacenters. Been operating since 2008 with 24/7 Support 365 Days a Year. 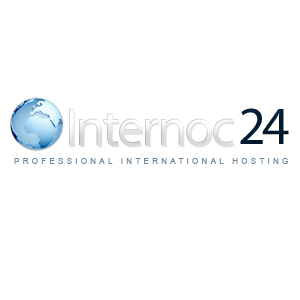 Internoc24 was the first Offshorehoster wich accepted Bitcoins for Web Hosting, Virtual Private Server (VPS), Dedicated Server and Domainregistration. My background: My bread and butter is to offer managed hosting to clients all over the world, and I have been doing so for 22 years. I was there when Redhat 3 was released, I was there when PHP was called PHP/FI and was simply a CGI-BIN application (no apache module those days). All I can say is that Internoc24 is the worst company I've dealt with in my 22 years of running Linux. I've dealt with them all: Ramnode, Linode, VPS2Day, the now defunct and horrible Verelox, OVH, AWS plus a whole long list of companies. I've used this company twice, mainly due to their far below market prices. This company's business model is to get you to pay as quick as possible, and once you've paid, they will not answer your billing or support queries. The only thing "quick" about this company is their sales department. I've ordered a bare-metal server from them, they promised to get the server up and running in 48 hours, and from there just went quiet. My queries to the billing and support department went unanswered for weeks. I then had to get another server for my client at my cost. After exactly 4 weeks later they finally delivered the server, but it was already too late, I've set up a different server at a different company. The best of all: they bill you for the full 4 weeks where the server wasn't even active and expect you to fork out the money. Fast forward 2 years: I decide to give them another try. This time I order a VPS server which most companies set up in seconds. Again, the same story, they promise the server would be ready in 48 hours, and then they took 2 weeks (or, to be exact, 1 week and 5 days) to provision the VPS server. Again, not a single one of my support tickets were answered. Again, I was billed from the sale date, not the server's setup date. This seems to be a recurring theme with them, and that's probably why their servers are so cheap... they bill everyone for services not rendered. My professional recommendation is to avoid this company. We have an Estonia VPS from Internoc24 since 2015. Sometimes the VPS was down (most in result of Kernelupgrade or Intel Security Kernel Fixes and the VPS dont boot automatically after upgrade finished), but the support is friendly and our request very fast. We pay only 2€/month for this exotic VPS, this is realy cheap. We get what we pay, not perfect in overal, but perfect for 2€. Try to use bpw.sc offshore hosting.